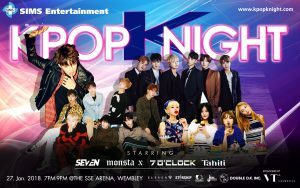 On January 27, Kpop Knight hosted a concert at Wembley Arena in London, to the excitement of U.K. K-pop fans. Unfortunately the organizers were massively disorganized, causing confusion and technical difficulties. Despite that, though, the four acts (7 O’Clock, Tahiti, Monsta X, and Se7en) made the best of a crappy situation and delivered an incredible show. Each group performed around 30 minutes each, just enough time to introduce the audience to the groups they may be unfamiliar with. First up was 7 O’Clock, the rookies of the lineup. I hadn’t heard of them before the concert, but was pleasantly surprised when they took the stage. They performed five songs, one of them a medley they did on Mix Nine. They were down a member since their leader A-Day was chosen on Mix Nine, but they still shone. I was particularly impressed with their rapper, Vaan, and their choreography. 7 O’Clock put on a great show and I’m sure the majority of people left converted. I know I was. Next up was Tahiti. Unfortunately we can’t avoid talking about the aforementioned disorganization for their set. For roughly the first minute of their set, they were completely in darkness. They handled it like professionals, making it through their introductory song with ease. But it’s disappointing whoever was in charge of lighting didn’t have the cues down. Tahiti handled it well though, making it through their set. They interacted with the fans the most out of all the groups. They were playful with each other and the audience. It was great to see a girl group there, even if it’s a less popular group like Tahiti. I particularly enjoyed their song “Phone Number.” It really shows of their vocals, especially of their lead vocalist, Jerry. Oddly, the third set went to Se7en. 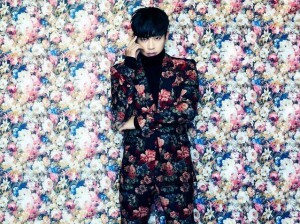 I honestly expected Se7en to be last since he’s the most senior performer, but he wasn’t. I immediately reverted back to being 17 when he came on stage, screaming louder than I had yet that night. He put on an amazing show, even performing his debut single, “Come Back to Me.” Se7en can still dance, can still sing the way he used to when he first started promoting. At one point he stopped and surveyed the crowd, and with a huge smile, told them how shocked he was to see that they were all there. Last up was Monsta X. I have seen them quite a few times now and each time they just continue to impress me. Their stage presence is as flawless as their choreography, but I might be biased. They were clearly the main draw for the evening. Most of the people there cheered and screamed and sang along like their lives depended on it. When Kihyun asked if people would come see them if they did a stop in London, he seemed shocked by the resounding yes he received. They closed the night and left the crowd hoping for more. Speaking of hoping for more, I generally agree with many of the complaints you may have seen on Twitter after the event. The pricing for this concert was, to put it mildly, outrageous. I myself purchased the VIP tickets which were £120 during the promoter presale. I didn’t even pay that much when I saw G-Dragon last year. Yes, I was pretty much against the barrier. Yes, Ari from Tahiti and Minhyuk from Monsta X waved to me and my friend. Sure, I got two free makeup items. But that price is steep, even for a K-pop concert. Se7en’s meet and greet tickets were priced at £400 which is insane. I can’t speak to whether or not it’s true that only three people purchased them, but I can understand why only a few people would buy them. I love Se7en and the opportunity to meet him would have been amazing, but for that high a price, I needed to opt out. The organizers did not seem to know what was going on and the concert didn’t run nearly as smoothly as it should have. The amount of technical problems alone makes me wonder whether or not they even bothered with a soundcheck and if they did, if the lighting technician and sound engineer slept through it. This wasn’t a big festival. It wasn’t nearly as big as any of the KCon’s so it really should not have been difficult for them to get this to go smoothly. There was barely any promotion and the event was announced on social media before Wembley was even officially aware that it was being held there. Everything felt very last minute, despite what the organizers said. In short, Kpop Knight was a mess. I did thoroughly enjoy the concert, but I truly hope that the negative experiences the groups may have had won’t deter them from returning to the UK. Maybe just with better promoters and organizers next time.